Major League Baseball fails to capitalize on its gay fans. 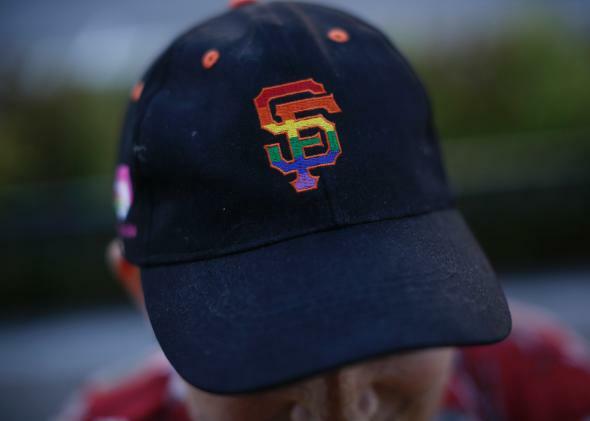 A baseball cap with a rainbow-colored San Francisco Giants logo. Can you believe we resisted a pitchers and catchers reference? A simple night at the ballpark can be a daunting prospect for gays who see professional sports arenas and stadiums as unwelcoming to the LGBTQ community. In the not-so-distant past, gay couples have been formally reprimanded or even kicked out of the stadium for kissing. It’s not uncommon to hear gay slurs from immature or inebriated fans; sometimes the athletes join in with the homophobia. Nevertheless, gay pride nights are popping up at ballparks around the country, filling the stands with thousands of cheering, peanuts and Cracker Jack munching LGBTQ baseball fans. But Major League Baseball doesn’t often share the love. While its players show the league is ready for a gay player, MLB leadership and individual franchises barely acknowledge gay fans. And that’s a lost opportunity. Ballpark gay pride events come in all shapes and sizes. Organizers in Washington, D.C., expect nearly 4,000 fans to come out for this month’s Night OUT at the Nationals. The Chicago Cubs lays claim to the longest-running annual gay pride night, dating back to 2001. (And the Cubs know their neighbors in Boystown: The club rescheduled a game this season in order to ease congestion during the city’s pride parade.) Some teams host such events sporadically, like 2013’s anti-bullying-focused GLAAD Spirit Day in Atlanta. Others are just beginning: The Los Angeles Dodgers hosted their first official LGBTQ night last year—13 years after kicking out a lesbian couple who kissed after a home run. Gay nights demonstrate how important it is for LGBTQ fans to feel comfortable at the ballpark—whether that means chatting with friends, holding hands with your partner, or ending up on the kiss cam—and how far we have to go before achieving that level of comfort. In an email to Slate, MLB Senior Vice President of Public Relations Pat Courtney said, “We are happy to see the clubs welcoming the LGBT community. … Baseball and sports can make a meaningful difference in changing opinions of how the American public perceives the LGBT community.” Courtney’s statement also touted MLB’s ties to the LGBTQ organization Athlete Ally, which sounds good at first blush, but quickly loses its luster—this is the same organization that recently resigned from the LGBT Sports Coalition after deliberately and pre-emptively outing UMass basketball player Derrick Gordon. In lieu of an interview, MLB representatives suggested that Slate instead contact the individual clubs that host such nights. “At the end of the day, they are the ones who are creating and executing all of the special game day promotions and they deserve the credit. So teams like the Giants, Mariners, Dodgers and others are the ones you should spend time doing your interviews with,” said MLB’s Matt Bourne. Tell that to gay fans in cities that aren’t West Coast liberal meccas. Take a look at the Philadelphia Phillies, who host separate official “heritage” theme nights for Latino, Italian, German, Irish, African American, Jewish, and Christian fans. This is a great way to bring communities together at the ballpark. Other stadiums host singles nights and zombie nights. (There may be some crossover between those last two groups.) But the Phillies leave it up to an external organization, Philly Gay Days, to organize the LGBTQ night, just as a corporation might wish to host a day at the park for its employees. In an interview with Slate, Larry Felzer, who organizes the Phillies’ LGBTQ night, emphasized how welcoming and accommodating the Phillies have been toward his organization—even helping to subdue in-the-park anti-gay protesters in the early years of the event. Most other ball clubs have similar stories. Thanks in part to trailblazers like Michael Sam and Jason Collins, professional sports are going gay. And sports leagues are cashing in on the historic moment. Sam’s and Collins’ marketing success has demonstrated to pro sports franchises that gay fans matter. Thanks in part to wildly successful gay nights, MLB could capitalize on its gay fans, too, but for the most part, it doesn’t. Strangely enough, it doesn’t seem willing to step up to the plate. Some of this year’s LGBTQ nights include: Boston Red Sox, June 12, 2014; Chicago Cubs, July 12, 2014; Chicago White Sox, Aug. 16, 2014; Philadelphia Phillies, Aug. 5, 2014; San Francisco Giants, June 26, 2014; Tampa Bay Rays, June 21, 2014; Washington Nationals, June 17, 2014.